THE province of Albay in Bicol doesn’t exactly conjure images of luxury and pampering. To most people, it just means the ever-rumbling Mayon Volcano, rows of abaca plants, and a great deal of pili nut products. Oh, yes, and who can forget—the devastating typhoons that always seem to batter the area? Surprisingly, as my friends and I arrived in Legaspi City after leaving Manila’s rain-drenched streets only an hour before, the sun was shining at its mightiest. We were later told that in this part of the country, the weather is actually the reverse of what it is in Metro Manila. So if you feel that vacation itch during the rainy season, the Bicol region is actually the best destination to escape to. We were on our way to Misibis Bay Raintree, one of only three Philippine establishments that have made it into the Small Luxury Hotels (SLH) of the World group. SLH counts only 500 of the most exclusive establishments in the world which cater to a very discriminating clientele in terms of luxury and hospitality. Upon our arrival at the airport, we were met by the friendly resort staff and whisked off in a van to its dock at the newly built commercial and entertainment complex, the Embarcadero at the Legaspi port. A fancy welcome of bubbling champagne and suman awaited us, while cool pleasantly scented white face towels did the trick in refreshing and energizing us for the next part of our journey. We then boarded a fastcraft for the 30-minute ride to the lush and verdant Cagraray Island, located northeast of Legaspi. Everywhere we looked, the calm azure waters provide a delightful contrast to the sunny cloudless sky. The only visible puffs of white were from Mayon Volcano, no longer with the perfect cone, but still unparalleled in its grandeur. Local folk dancers dressed in colorful costumes welcomed us as we made our way to the Spice Market, the resort’s main restaurant. It being the early morning, and already battling low blood-sugar levels, we eagerly wolfed down our breakfast of fried garlic rice, sunny-side up eggs, and New Look, a very meaty dried fish that we discovered on our visit last year. (It’s called New Look because the specie was only discovered in the waters of Bicol sometime in the 1960s, and has yet to be identified with any scientific name, or so a local fisheries graduate told us.) Super-addicting! After a hearty breakfast, we were led to our beachfront villas, where a soothing foot scrub and massage awaited us. The villa I was assigned to had a commanding view of the sparkling Albay Gulf and the clear blue sky visible through floor-to-ceiling picture windows. It also had a sundeck with two lounging beds where guests could soak up the rays of the sun. The main feature of each of the villas is, of course, the king-sized bed and fluffy goose-down pillows all wrapped in 350-thread count linen. It was so heavenly to sink into, it took much effort to get up from after a nap or a night’s rest. Imagine a stunning view of peaking waves and drifting clouds each morning, and lying in a huge comfy bed...now that’s what I call a vacation! Even when it drizzled, it was just so peaceful and serene to lie in bed, under the snug covers, neck cradled by gentle pillows, and look out those windows. The villa also had a large heated bathroom where guests can bathe using either the generic bottled bathroom amenities or L’Occitane toiletries. What I did appreciate was the warm sudsy bath the butler prepared on the dot, at 6 pm, each evening. Returning to the villa from a vigorous yoga workout and soaking in that bathtub even for just 30 minutes was so divinely comforting. 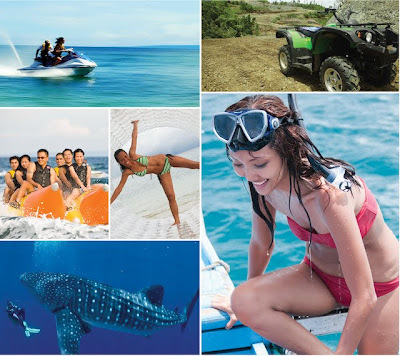 Adventurous guests have lot of activities to choose from, such as jetskiing, windsurfing, skipping on the water via the banana boat ride, snorkeling, lava trekking near Mount Mayon, and doing the zip line. My pal Marianne went scuba diving just off the Misibis dock and was pleasantly surprised to have seen a manta ray with a 6-foot wingspan swim near her and her dive master. She said it was so close, it could’ve been possible for her to just reach out and touch the creature’s belly. And this was just in 30 feet of water. In the evening, one can enjoy the nightly entertainment provided by the resident lounge singers, sing yourselves hoarse at the videoke room, or just chillax watching a movie in the den. And if you can’t really tear yourself away from your busy urban life, there is a business center where you can check your e-mails, or insanely update your Facebook status detailing all your activities at the resort.